Sorely tired feet. The only thing that I wanted to do is to rest after working for the whole day. I've been moving to places, and my feet are all tired and sore after all the craziness from my everyday routine. On mornings I get up, get dressed and wear my usual killer dress and shoes while talking to the managers, clients and to my team mates. In the evenings I dressed up again, this time in my usual running gear that consists of a jogging pants, tank top and running shoes, running in circles in the park that is few blocks away from the so that I can shed those fatty layers in my body. It's been tiring but I've been used to it. That is why I would love to have a massage or anything to comfort my sorely tired feet everyday. Massages can be cheap, but it can be a hassle if you do it on a daily basis. While having a foot spa treatment is another great idea, but it only offer temporary relief. I would love to have this extreme comfort everyday. Then I saw this gel socks promo from Metrodeal. And so the gel socks that I bought from Metrodeal is a total lifesaver. It was really comfy, makes my sorely tired feet more relaxed and it's now more soft. I absolutely love how it helps me big time, and its overall benefit for me. Good thing that I bought 2 pairs for my own use. I've been using these at home and at the office, whenever I had no meetings outside the office and only if I had tons of office work to be done. I also love to use this while at home, especially after I had my evening shower and read a book. This is one great innovation for me, for our feet is the most overworked part of the body. 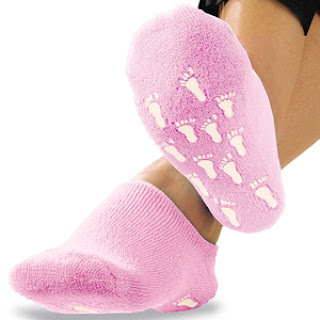 To have this ultra-relaxing gel socks is a great help for all. You also need this, just trust me on this one!